A crew led by a Scottish adventurer who says he is descended from Christopher Columbus have shattered the record for rowing across the Atlantic. Leven Brown, 35, of Edinburgh, skippered the 14-man La Mondiale crew, which arrived in Barbados at 2040 GMT. The crew, which had set off from Gran Canaria on 15 December, beat the record set by a French team, on board the same boat, in 1992 by more than two days. The previous record was 35 days, eight hours and 30 minutes. It now stands at 33 days, seven hours and 30 minutes. Mr Brown - originally from Galashiels in the Scottish Borders - already holds the record for rowing solo across the Atlantic, taking 123 days to cover the distance between 2005 and 2006. He gave up his job as a stockbroker and sold his flat and car to fund the challenge. Mr Brown's partner Yvette Jelfs, 41, from Staunton-on-Wye, Herefordshire, said the crew had put "everything" into the record and now they were going to celebrate. "I can't believe that they've actually managed it," she said. "Leven took on a boat that was just an empty hull, a lot of people said it was impossible and kept running Leven down, but he's a very steady person and has just carried on and on until he achieved it. "We've organised a big party for him and the crew." The 53-foot boat was racing head-to-head against a US multi-hulled rowing boat called Orca, which left the Canaries at the same time but is a long way behind after suffering technical problems. The Ocean Rowing Society International said La Mondiale has already broken a 24-hour distance record of 117 miles and became the first ocean rowing boat to travel more than 100 miles per day for nine consecutive days. A total of 60 previous attempts have failed to better the 3,000 mile time set by the French. Speaking to the BBC as La Mondiale approached the coast of Barbados on Thursday morning, Mr Brown, from Edinburgh, admitted the cramped conditions had occasionally led to frayed tempers among the crew as the boat covered up to 117 miles a day. But he said the sight of land in the distance meant spirits were high as La Mondiale entered the final leg of its journey to Port St Charles. La Mondiale moved 24 hours a day, seven days a week since setting off more than a month ago, with the crew operating a two-shift rotation. Mr Brown said the crew rowed for two hours then rested for two hours. "The record has stood for more than 15 years, it has been held by the French, and we are relishing the prospect of possibly knocking a couple of days off this long-standing record," he said. "There's not going to be a lot of dry eyes once we get to Barbados, assuming we get there in one bit." 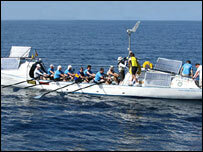 Mr Brown said conditions were perfect for rowing as La Mondiale got to within 40 miles of Barbados. Mr Brown hand-picked his British and Irish crew after buying La Mondiale from the French before renovating it to make it lighter and faster. He already holds a Guinness World Record for being the first person to row from mainland Spain to the West Indies, and was the first rower to conquer Spain's notorious Bay of Cadiz. The adventurer believes he is related to Christopher Columbus through his great grandmother, Mary-Jane Sinclair. As a member of the Atornish Sinclair family, both are direct descendents of the great explorer through Prince Henry.